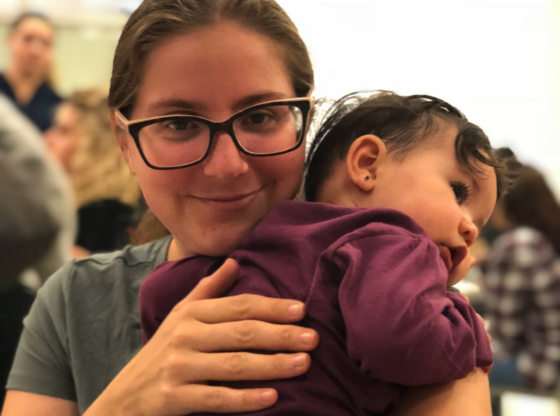 Being a full-time student, wife and mom may sound far-fetched to some, but to Nicolette Grande it is her everyday life. With the help of her husband – who is also a student here at SFC – and the motivation of being a new mom, the 23-year-old is determined to get a degree and fulfill her dream of being an ultrasound technician. Nicolette grew up on Long Island, NY and lost her mother at age 13, so finding out she was expecting and that the baby was a girl was the best news the student could hear. Nicolette is majoring in radiology science, and comes in to school 3 days a week, including Saturdays. When talking about the school work and parenting balance, it definitely is not easy. But no matter what, the baby “always comes first” in the student’s life. When Nicolette is in class, her husband, Gabriel Grande, watches baby Winter and vice-versa. “I have some help in the cafeteria from some of my friends, they take her when I’m doing school work” said the mom. “It is a little bit stressful.” Fortunately, the school is able to provide Nicolette with accommodations so that she can move test dates and times around so that they are more fitting for her schedule. Although she does have help, it is not always enough. After mentioning this day-care idea to student affairs, it is said that the school is “thinking” about the possibility. Though this all seems like a lot to handle right now, Nicolette knows that getting her degree will all be worth it.